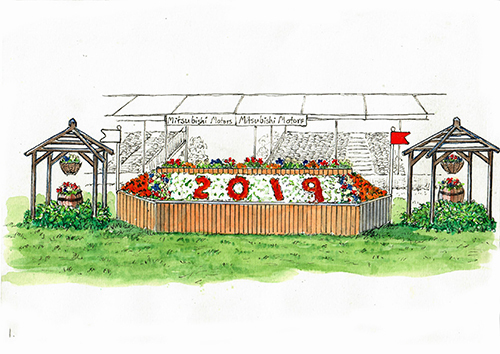 Take a fascinating interactive tour with six times Badminton winner Lucinda Green and course designer Eric Winter. Filmed walk-throughs, drone flyovers, photos, audio, intelligent direct and alternative routes and statistics. Click any fence to start. Best viewed in full screen mode. 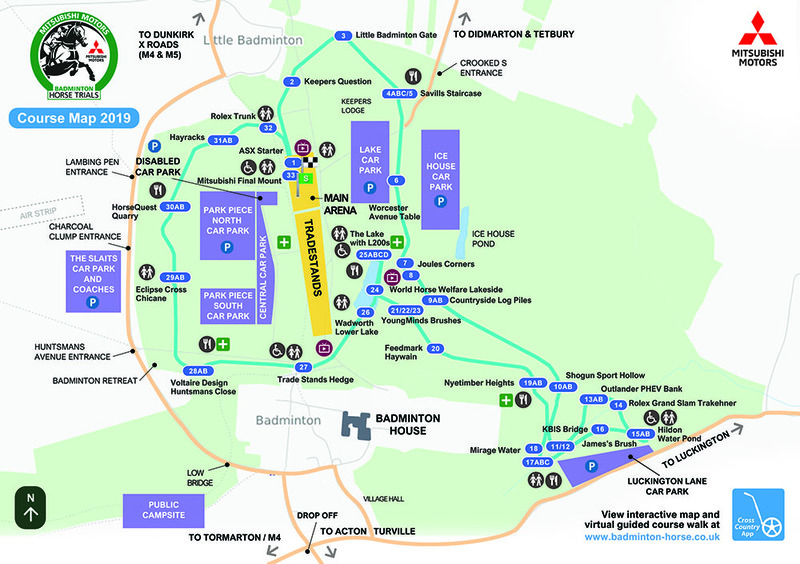 Download the course before you head to Badminton with the free CrossCountry Lite iPhone app. Use it anywhere on course; no internet required. Or take advantage of the free WiFi in the Food Courts and Trade Stand area. 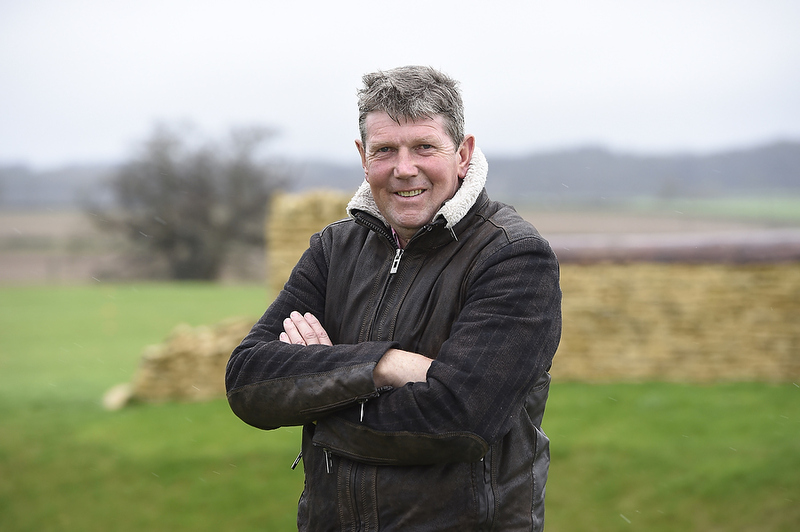 2019 is Eric’s third year as course designer at Badminton. He likes to change things around and describes this as a different course to what we’ve previously seen from here. One of old fashioned questions but with lots of things for the riders to do! 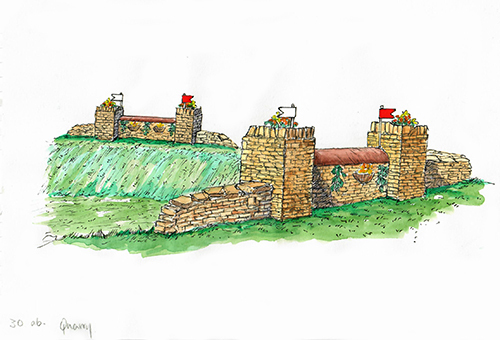 Artwork of the fences is by Caroline Bromley-Gardner. 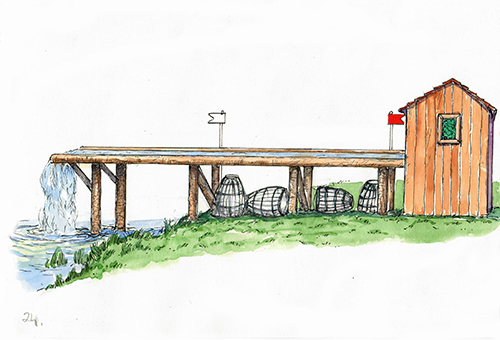 Full size versions of the illustrations below can be viewed in our online gallery here. 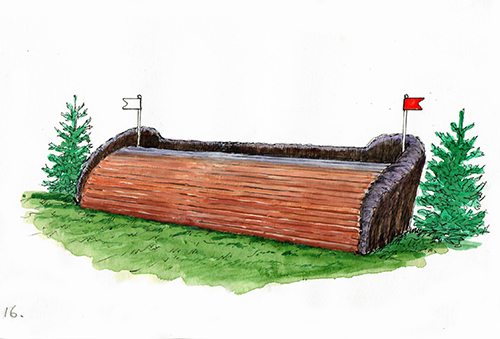 Rider’s jump the first fence in the atmosphere of the main arena. 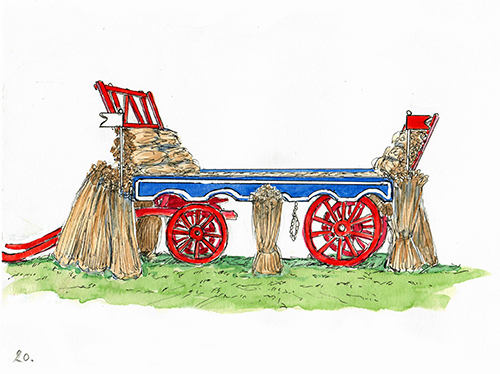 The ASX Starter is highly decorated to stand out for the horses and help to focus them on the job inhand. A big table with a ditch towards. 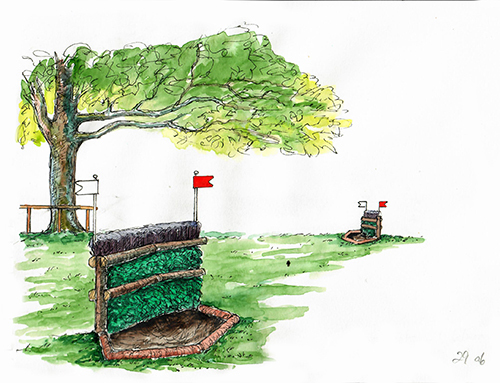 Eric has brought the front of this fence down in front slightly to give a kinder profile and filled the ditch with trees but it’s still an imposing sight this early in the course at 1.16m high with a base spread of 2m. Approaching up a steep little bank, riders can choose to jump either left or right handed over one of these very upright gates. 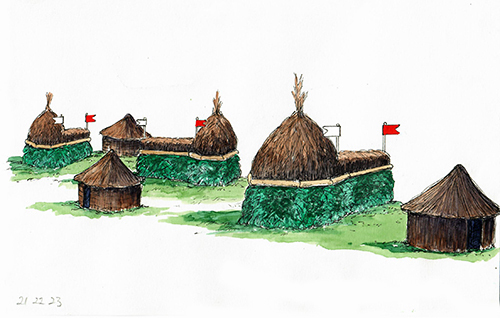 Their positioning and profile make this quite a tricky little fence and means competitors will need to be on their game early in this course. Element a is an imposing 1.20m spread before riders tackle the staircase. 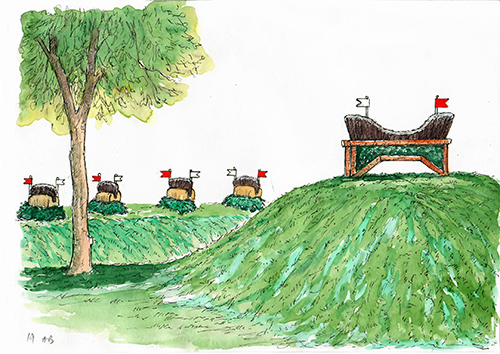 With fresh horses having a tendency to run on down the slope the fence will test the riders’ control and their ability to have them back in time to jump the second only slightly smaller spread of fence 5 at the bottom of the hill. 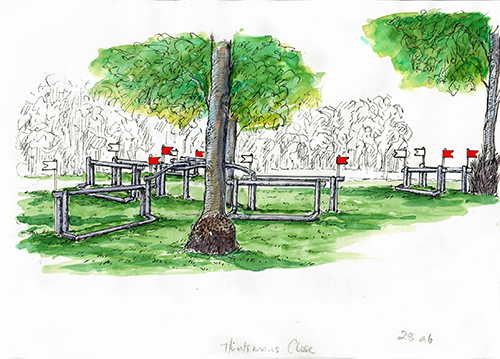 A birch table set in trees challenges riders to select their approach line. Taking it on the inside at an angle will help the riders to flow along the course track, saving vital seconds. Others will choose to go wide around the trees for a more direct approach and take a twistier route. Two sizeable corners to take on a straight or curving line. 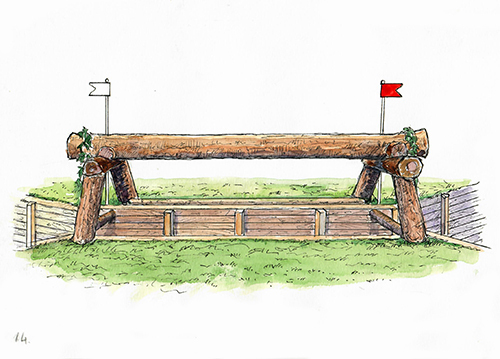 Riders have a choice here of whether to take the direct route over a single daunting 1.20m x 2m fence or two much smaller ones. After riding through the pergoda riders negotiate a ditch into the hollow before choosing their line to an open offset log to the left or right. 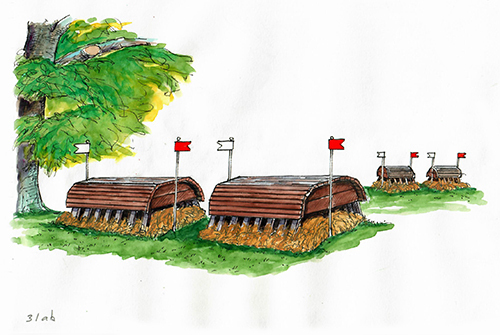 Old school Badminton at its best, this big question is made more difficult by being on a slightly downhill run, meaning riders will really have to hold their line to take the direct route. A new challenge at the Outlander bank sees it jumped cross ways for the first time. 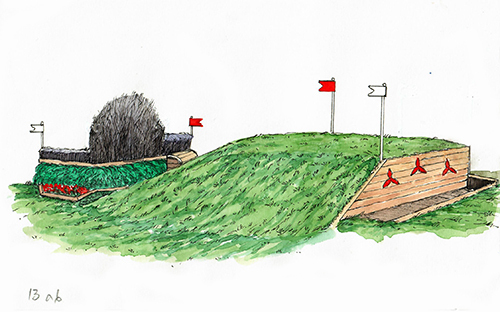 Combinations step up across the narrow profile of the bank and down to a narrow brush with a drop on landing. Rewarding sympathetic riding, adjustability and clever footwork, there is a slower alternative for those who need a bit more time. 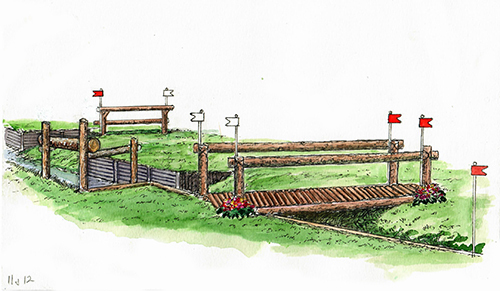 A big ditch and a proper rider frightener but for experienced horses and riders this shouldn’t pose a problem. 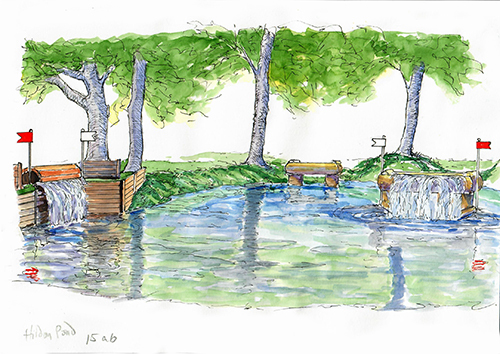 The first element here might only be 70cm high but with a 1.8m drop into the water the riders will have to be on their game to prepare them for the cascading waterfall of element B. A beautiful big run and jump fence to give the horses a boost after the water and muster confidence before the very big question to come. 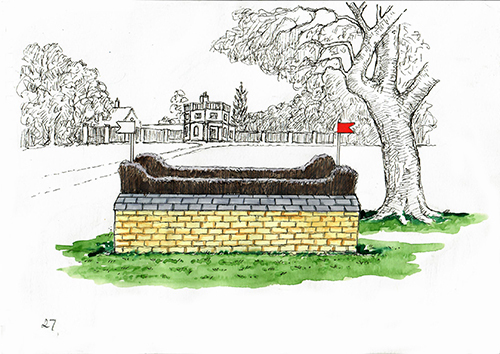 Horses must come back from the gallop to focus on this tricky combination of a right angle corner over an old fashioned ditch to a second big right angle corner. 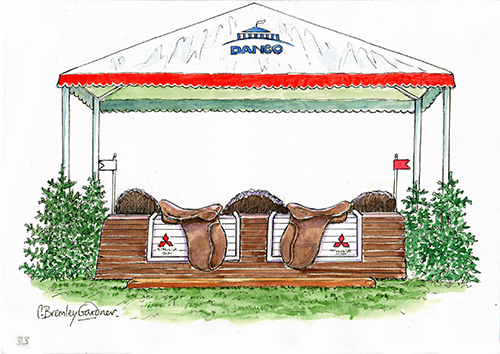 It will be fascinating to see how riders take this fence. From a blind drop over the birch brush into the hollow, they must find their line out and choose one of four brush fences to jump. 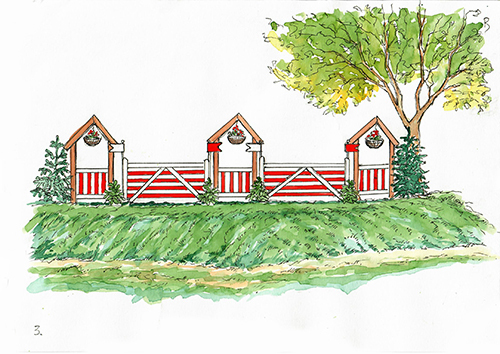 A traditional sight on the Badminton course, this fence is a welcome breather for horse and rider. The three related brushes sweep competitors down towards the lake and are a bold question if taken on the direct route. 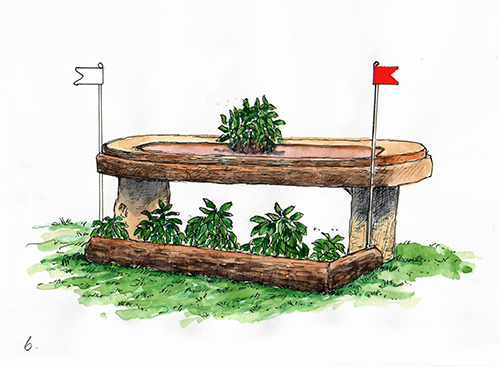 A new fence on the course, horses approach this spectacular table from a steep turn which interrupts their rhythm to jump this fence with a maximum top spread of 1.8m. 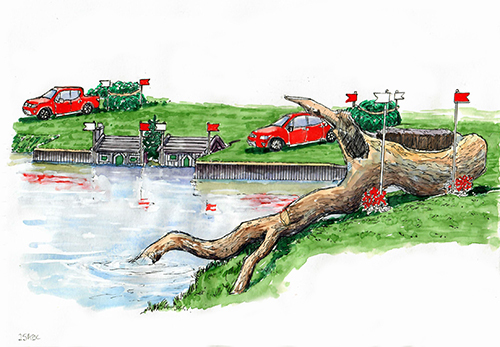 Riders jump in over the fallen tree and then can choose either a quick route out with a sharp right hand turn up the bank and over the L200 brush, or a longer more flowing route with an extra jumping effort. 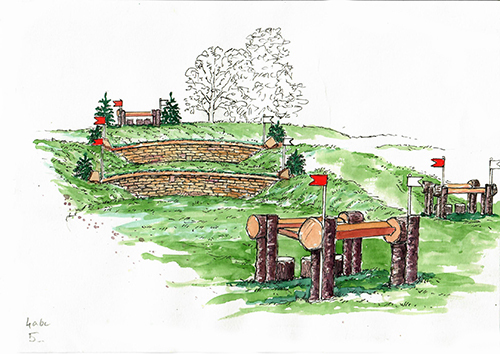 An unusual triple bar coming out of the lake should ride well but is not to be disrespected with a sizeable drop on landing. 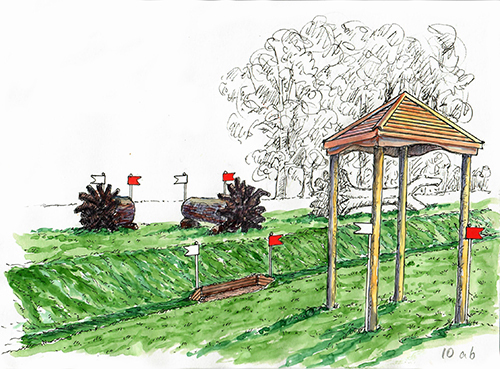 A big brush fence to keep the horse’s attention in the long gallop towards Huntsmans Close. 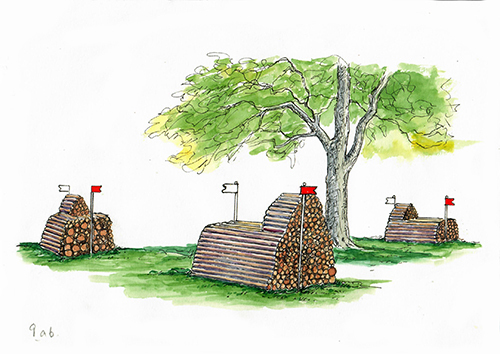 Riders must navigate their way between the trees and birch rails to choose their line over two oxers. 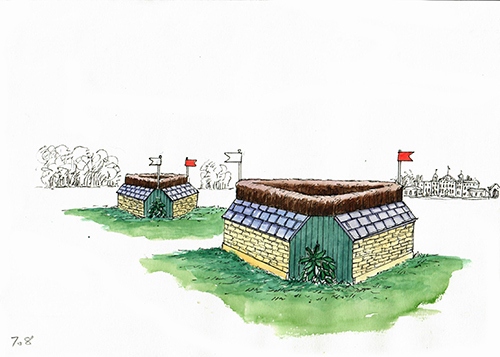 Two angled brush fences with ditches in front are a test of accuracy and control to keep the riders thinking and focused on the job. 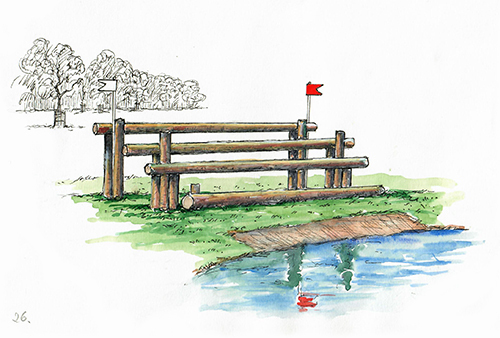 Element A is a big drop fence down the bank of this iconic Badminton landmark. The challenge here is to rebalance the horses and have enough in the tank to see them out over element B at the top of the slope. 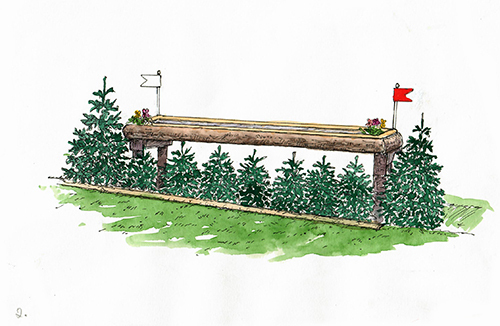 Riders must stay respectful of what should be a straightforward enough combination fence on their homeward leg. 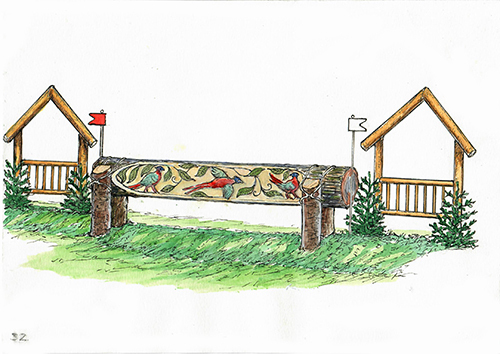 A run up the bank should put the horses in great shape to jump this big carved treetrunk and see them on to the final fence. The final fence comes in the main arena with the roar of the crowd to see our brave competitors home.